This work was created just before the time that Photomosaics really became popular. The painting was basically a bunch of photos that work together to create an portrait of my Uncle Dave. However, I painted the photos individually. The images are from a variety of sources.. family photos, and a variety of other scenes, some which were not actually derived from photos, but were scenes I had lived through in person or had some knowledge of… The inability to really tell the whole story that was behind my reasons for creating this work led me to create the Installation later. I might try to get a better photo of this painting later since there appears to be some glare on this one. 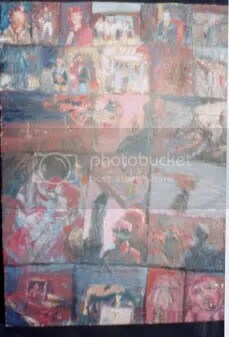 This entry was posted in 1999, art, artfolio, head, helicopter, hero, human, illustration, inspirations, oil painting, painting, people, photo, photograph, photography and tagged art, artist, artists, artwork, drama, memorial, oil painting, painting, photo, scene by Jeff Thomann. Bookmark the permalink.